Memphian Billy Cunningham was a hyperactive individual full of energy, but was apparently nevertheless fun to work with in the studio. 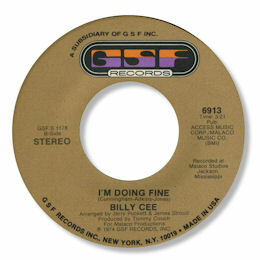 He first recorded in Jackson, MS and Malaco leased the interesting “Don’t Matter To Me”/ I’m Doing Fine to GSF in ’73. The former was one of the tricksy rhythmic mid pacers that James Stroud and Tommy Couch did so well, and “I’m Doing Fine” a pleasant big voiced ballad that really grows on you. But his next release back in Memphis was the highlight of his career. 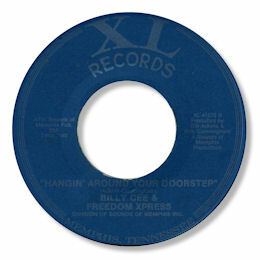 Hangin’ Around Your Doorstep was sensational deep soul – a superbly constructed song given the royal treatment by Cee and a stellar group of musicians. XL only put it out locally and so it is astonishingly rare today – especially as it did nothing in terms of sales. Not really surprising as this sort of gut bucket soul was totally out of style by 1975. But that hasn’t stopped this disc achieving legendary status over the years. Sensational. Malaco tried Billy on their own Chimneyville label with a version of Sir Mack Rice’s funky “Dark Skin Woman” a couple of years later, but again nothing happened sadly. His big voiced cut of “I Believe In Love” which remained unissued until recently, utilised the same backing track that appeared on Chuck Brooks' Malaco 45 of ’77 and must have been recorded around then. Note ~ Both sides of the XL 45 can be found on various volumes of the Ace UK series of CDs on XL and Sounds Of Memphis. "I believe in love" can be found on the Soulscape CD "Troubled Waters".